« Fetal cells in Mother of five (2 miscarried, 2 aborted, 1 born) team up to save Mom? Over sixty leaders of faith-based organizations or who work with faith-based organizations wrote a public letter the Obama administration protesting the very narrow exemption to the health insurance contraceptives mandate. The letter also asked that the administration not adopt in its place a different definition of “religious employer” for the exemption, suggested by some groups, that would still leave out many faith-based organizations. Signatories of the letter include Protestant and orthodox Jewish leaders representing several religious colleges and universities, k-12 schools, grassroots faith-based organizations, denominations, law associations, rescue missions, and more. Up until now, U.S. Bishops and other Catholic groups have mounted the most vocal opposition to the upcoming mandate, which would force virtually all employers to offer birth control, including abortifacient drugs, without copay. Dr. Richard Land, President of the Ethics & Religious Liberty Commission of the Southern Baptist Convention; Tom Minnery, Senior Vice President of Focus on the Family; Stanley Carlson-Thies, President of the Institutional Religious Freedom Alliance; and Nathan Diament, Executive Director for Public Policy for the Union of Orthodox Jewish Congregations of America, were among the signatories. The letter came soon after Cardinal Newman Society (CNS) President Patrick Reilly raised the alarm over an alternative definition of “religious employer” proposed by the Catholic Health Association and the University of Notre Dame that he said would still leave unprotected many faith-based service organizations. The religious leaders concurred that the proposed revision would threaten several faith-based groups, and would write into federal law a definition of “religious employer” that wrongly encompasses only churches and church-controlled organizations. The letter was circulated to and signed only by non-Catholic organizations and leaders. “We write not in opposition to Catholic leaders and organizations; rather, we write in solidarity, but separately—to stress that religious organizations and leaders of other faiths are also deeply troubled by and opposed to the mandate and the narrow exemption,” it stated. In addition, The Becket Fund announced Wednesday that Colorado Christian University had become the first Evangelical school to fight the abortifacient birth control mandate in court. CCU’s lawsuit joins one filed by Belmont Abbey College, a Catholic institution, last month. We write to express our deep concern about the contraceptives mandate in the health insurance regulations, and about the “religious employer” exemption that is so narrow that it does not protect most faith-based organizations. We write to you specifically as organizations and leaders that are not part of the Catholic community. We write not in opposition to Catholic leaders and organizations; rather, we write in solidarity, but separately—to stress that religious organizations and leaders of other faiths are also deeply troubled by and opposed to the mandate and the narrow exemption. Most press reports on the controversy concerning the contraceptives mandate portray the opposition as coming only from the Catholic Church and Catholic organizations. But this is wrong. It is emphatically not only Catholics who deeply object to the requirement that health plans they purchase must provide coverage of contraceptives that include some that are abortifacients. It is not only Catholics who object to the narrow exemption that protects only seminaries and a few churches, but not churches with a social outreach and other faith-based organizations that serve the poor and needy broadly providing help that goes beyond worship and prayer. The faith-based organizations and religious traditions represented by the undersigned leaders do not all share the same convictions about the moral acceptability of the mandated services. But we are all deeply concerned about the narrow exemption, including proposals made to expand it while still leaving unprotected many faith-based organizations. Many of us previously signed a letter, dated August 26, 2011, to Joshua DuBois, head of the White House Office of Faith-Based and Neighborhood Partnerships, asking his help in persuading your administration, if it maintains the contraceptives mandate, to replace the current “inaccurately narrow and practically inadequate definition of ‘religious employer’.” An organization does not cease to be a religious organization just because it serves the poor and needy in material ways and does not confine its help to prayer and religious teaching. We reiterate our opposition to the narrow exemption. We wish to stress that we strongly object to a revised exemption that is only broadened enough to include faith-based organizations that are affiliated with a specific denomination. We understand that such a compromise has been proposed to your administration. The suggested compromise discriminates against the many religions that organize themselves in ways other than by being centered on a denomination. Mr. President, religious organizations beyond the Catholic community have deep moral objections to a requirement that their health insurance plans must cover abortifacients. 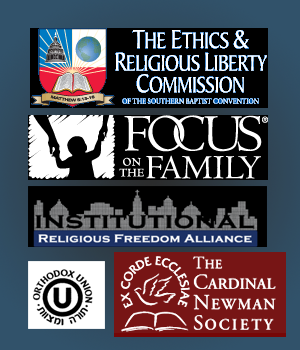 Religious organizations beyond the Catholic community object to the current narrow exemption which puts them outside the definition of “religious employers.” And religious organizations beyond the Catholic community object to any revision of the exemption that would limit it to churches and denominationally affiliated organizations. We believe that the Federal government is obligated by the First Amendment to accommodate the religious convictions of faith-based organizations of all kinds, Catholic and non-Catholic. This entry was posted on Monday, December 26th, 2011 at 3:48 pm	and is filed under News & Commentary. You can follow any responses to this entry through the RSS 2.0 feed. You can leave a response, or trackback from your own site.